Auditions are h﻿ereby announced for Opera South East's production of ﻿﻿Il Trovatore ﻿﻿for performances on 24th & 25 April 2015. The main auditions themselves were held on Sunday afternoon, 14 December 2014. Please indicate your interest here and our chairman, John Rycroft will immediately be informed. The closing date for audition applications is Thursday 4th December; a few days later you will be advised of your audition time. If selected for audition, you will be asked to sing a piece in English, preferably by Verdi though not necessarily from Il Trovatore. Audition as a Principal/Professional singer for Il Trovatore? Please provide a photo of yourself (maximum file size of 500KB). This particularly helps the OSE Committee through the audition day. Optional comments or notes. It is important you advise us of any Sunday rehearsals you cannot attend and any evenings you will be unavailable between 19-25 April 2015 (production week). 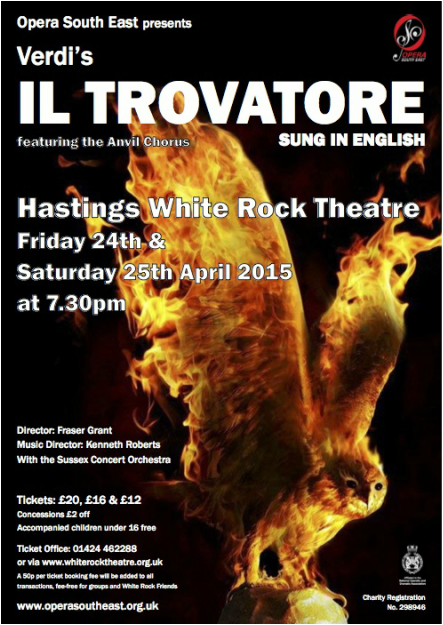 OSE are performing Verdi's Il Trovatore, in English, on Friday 24th & Saturday 25th of April 2015 at the White Rock Theatre, Hastings. We will be auditioning for the principal roles on Sunday 14 December 2014 at the John Taplin Centre, St Leonards-on-Sea, East Sussex TN38 0LQ, tentatively from 1pm-5:30pm. Apply here on the form to the left by Thursday 4th December and you will be informed of your personal audition time a few days later. We also very much welcome new members of the chorus - see Join us and Contact us. Audition applications to be returned to The Chairman by Thursday 4th December 2014. There is no guarantee of later applications being accommodated. Rehearsals are usually from 2-5pm on Sunday afternoons in St Leonards-on-Sea. Chorus music rehearsals will take place in January and February, every Sunday from 18th January, however Principals are only required from the start of production rehearsals with the Director, Fraser Grant, commencing Sunday 1st March 2015. There may be additional Principal rehearsals in London at other times to be mutually agreed. During the period of production rehearsals, there will also be additional weekday evening Chorus rehearsals, where the focus will be entirely on music. Principals are welcome but not expected.